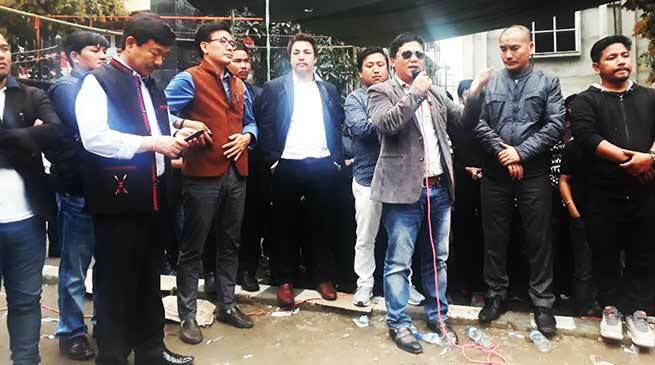 State BJP President Tapir Gao who visited the protesting students at NERIST campus, urged the students to withdraw their strike and said that union minister of MHRD Paraksh Javdekar has assured to deliver a Director for the deemed varsity in a week. “we had a party meeting regarding this and I myself had called Javdekar and briefed him about the situation. The union minister said that he is aware about it and that a full-time director will be deputed within seven days. I speak on his behalf and I pledge that if the demand is not met in this given time, I along with my party members shall join your protest”, said the BJP chief. Also speaking to the emotionally aroused students, AAPSU General Secretary Tobom Dai said that their struggle won’t go in vain. We on our part are doing our best and our support shall always remain, he said. Criticising the govt for the ‘disrespect shown’, he also warned that AAPSU may embark a state-wide strike if the govt does not pay heed to the demands of NERIST students. If any untoward incident happens in this course of strike, the state and central govt will be held responsible, he said. Continuing his line of attack on the govt the AAPSU leader also asserted that a ‘small spark should not be neglected’. “AAPSU team has also met the MHRD two times regarding this. I don’t understand why it takes 4 years to appoint a regular one”, he further said. SUN President Banta Natung said that, if assurances have to be made then it should come in written form or else the strike will go on. We are not here to listen to empty talks, we have had enough of it, he added. Meanwhile in RGU, a solidarity protest rally was carried out this morning from RGUSU office to the university’s main gate. Vehicular movement remained suspended for about an hour. The rally was participated by eminent social activist Prof Nani Bath, AAPSU, RGUSU, SUN and RGURSF members.